Berthe Marie Pauline Morisot was the grand-niece of the 18th century French master Jean-Honore Fragonard and - along with Mary Cassatt (1845-1926) and Marie Bracquemond (1840-1916) - became one of the leading female Impressionist painters, and a strong influence on Edouard Manet (1830-83), whose masterpiece Portrait of Berthe Morisot (1872) ranks among the greatest Impressionist paintings of the 19th century. After showing regularly at the official Paris Salon (1864-73), she exhibited together with Paul Cezanne (1839-1906), Edgar Degas (1834-1917), Claude Monet (1840-1926), Camille Pissarro (1830-1903), Renoir (1841-1919), and Alfred Sisley (1839-99), at the opening Impressionist exhibition in 1874, the first woman to exhibit with the group. In 1874, she married Manet's brother, Eugene Manet (1833-92), with whom she had one daughter, Julie (1878-1966). Berthe Morisot was born into a well-to-do bourgeois family. Her father was an official. With a natural talent for painting she received every encouragement from her mother. She copied pictures in the Louvre then, two years later, wanting to work direct from nature, she received some advice from Camille Corot (1796-1875) who became as a result an intimate friend of the Morisots at their house in Passy. In 1868 she met Manet, who was introduced to her by Henri Fantin-Latour (1836-1904). Following his example she became more eager to paint faces and portraits. Manet lured her into the Impressionist movement but she was never his pupil. 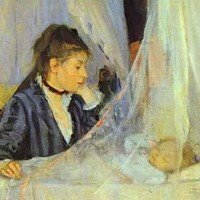 They influenced one another, and it was partly due to Berthe Morisot that Manet abandoned his sombre manner, brightened his palette and took up plein air painting. They were greatly attracted to one another, as can be seen by the many portraits Manet made of her: with a fan, with opera glasses, with a muff, with a bouquet of violets, and so on. In 1874 she married Eugene Manet, the painter's brother, but continued to paint, for in the same year she agreed, despite her success in the official Salons, to take part in the first of the Impressionist exhibitions, which was held at the house of Nadar, the photographer. She remained faithful to the group and took part in almost all their exhibitions. In 1874 she exhibited The Cradle. It depicts one of her sisters, Edma, watching over her sleeping daughter, Blanche. It is the first painting of motherhood to appear in Morisot's work, although the theme would later become one of her favourite subjects. Edma's gaze, her bent left arm, a replication of the child's arm, and the baby's closed eyes form a diagonal which links the mother to her child. The net curtain of the cradle lying between the viewer and the baby, further enhances the sense of intimacy and maternal love expressed in the picture. Edma, Madame Pontillon, who like herself had begun a career as a painter and had had the same masters as Berthe. But her marriage in 1869 to a naval officer stationed at Lorient, prevented her from continuing her interest in art. Berthe was very fond of her sister and painted her several times. The Musee d'Orsay possesses a portrait of Edma done in pastel, and a Butterfly Hunt which shows the young woman playing with her children in an orchard. Berthe Morisot brought to the Impressionist group a touch of sentiment which goes back to the oldest traditions of French art. The restrained emotion of the mother contemplating her child recalls fifteenth-century Nativities (the Nativity of Autun by the Master of Moulins) or those of Georges de la Tour in the seventeenth century (the Nativity at Rennes). Shown at the Impressionist exhibition of 1874, The Cradle was scarcely noticed although some critics did comment on its grace and elegance. After several unsuccessful attempts to sell it, Berthe Morisot withdrew it from display and thereafter the picture remained in Edma's and her daughter's family, until it was sold to the Louvre in 1930.  Race Horses in front of the Stands (1866-8) by Degas.  The Balcony (1868) by Manet.  Bazille's Studio (1870) by Frederic Bazille.  The Floor Scrapers (1875) by Gustave Caillebotte.  The Swing (La Balancoire) (1876) by Renoir.  Paris Street; Rainy Day (1877) by Gustave Caillebotte.  Young Woman Sewing (1886) by Mary Cassatt.  For analysis of other Impressionist genre paintings, see: Homepage.